Astronomers have produced a scientific gold mine of detailed, high-quality images of nearby galaxies that is yielding important new insights into many aspects of galaxies, including their complex structures, how they form stars, the motions of gas in the galaxies, the relationship of "normal" matter to unseen "dark matter," and many others. An international team of scientists used more than 500 hours of observations with the National Science Foundation's Very Large Array (VLA) radio telescope to produce detailed sets of images of 34 galaxies at distances from 6 to 50 million light-years from Earth. 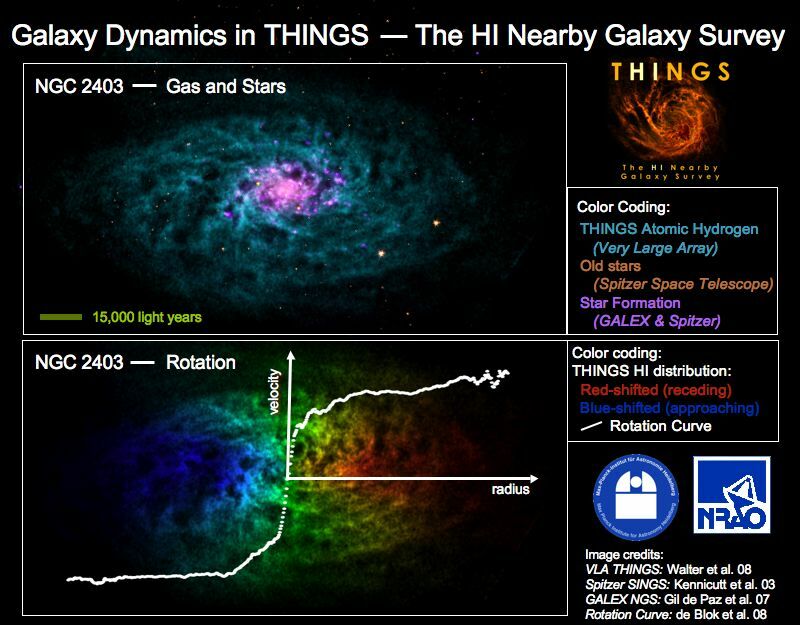 Their project, called The HI Nearby Galaxy Survey, or THINGS, required two years to produce nearly one TeraByte of data. HI ("H-one") is an astronomical term for atomic hydrogen gas. The astronomers presented their initial findings to the American Astronomical Society's (AAS) meeting in Austin, Texas. "Studying the radio waves emitted by atomic hydrogen gas in galaxies is an extremely powerful way to learn what's going on in nearby galaxies. 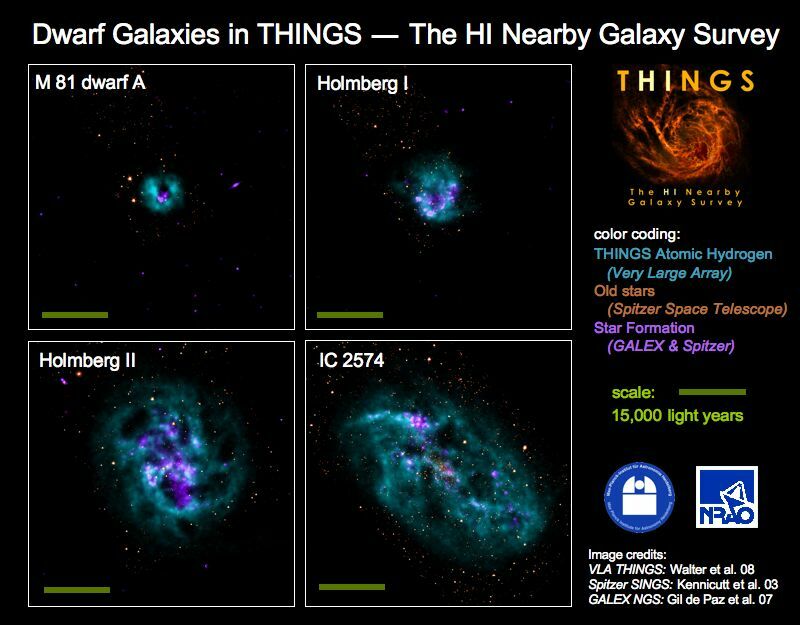 The THINGS survey uses that tool to provide sets of images of the highest quality and sensitivity for a substantial sample of galaxies of different types," said Fabian Walter, of the Max-Planck Institute for Astronomy in Heidelberg, Germany. Dwarf galaxy IC2574, left, and spiral galaxy M74, in THINGS images. 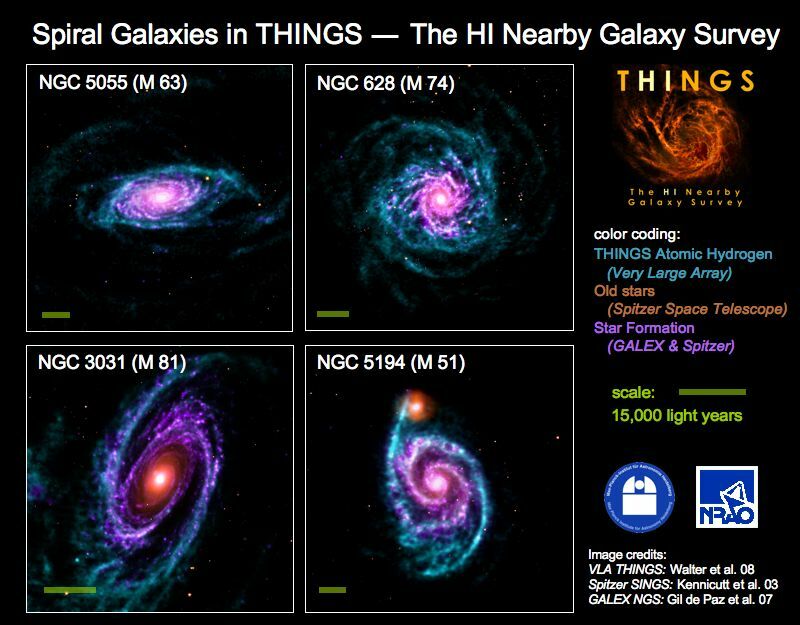 Most of the galaxies studied in the THINGS survey also have been observed at other wavelengths, including Spitzer space telescope infrared images and GALEX ultraviolet images. This combination provides an unprecedented resource for unravelling the mystery of how a galaxy's gaseous material influences its overall evolution. Analysis of THINGS data already has yielded numerous scientific payoffs. 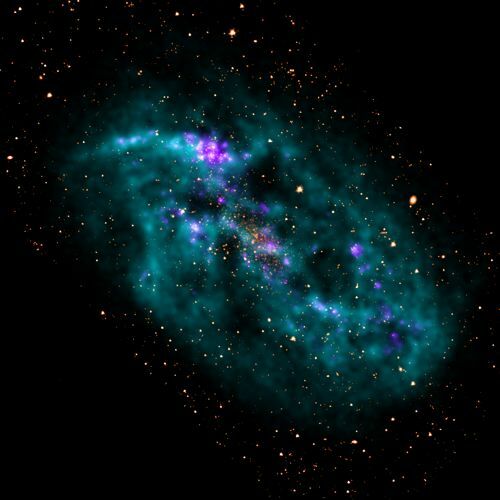 For example, one study has shed new light on astronomers' understanding of the gas-density threshold required to start the process of star formation. 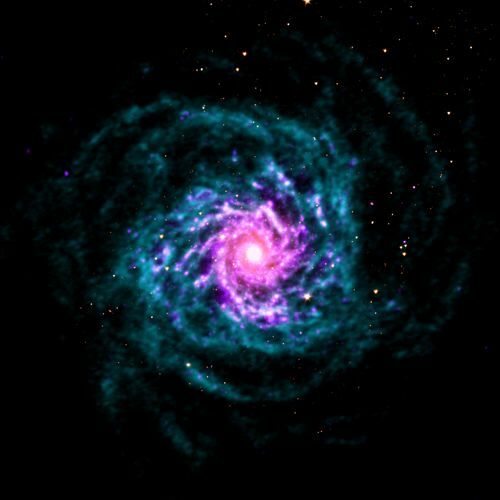 "Using the data from THINGS in combination with observations from NASA's space telescopes has allowed us to investigate how the processes leading to star formation differ in big spiral galaxies like our own and much smaller, dwarf galaxies," said Adam Leroy and Frank Bigiel of the Max-Planck Insitute for Astronomy at the Austin AAS meeting. Because atomic hydrogen emits radio waves at a specific frequency, astronomers can measure motions of the gas by noting the Doppler shift in frequency caused by those motions. "Because the THINGS images are highly detailed, we have been able to measure both the rotational motion of the galaxies and non-circular random motions within the galaxies," noted Erwin de Blok of the University of Cape Town, South Africa. The motion measurements are providing new information about the mysterious, unseen "dark matter" in the galaxies. "The non-circular motions revealed by the THINGS observations, turn out to be too small to solve a long-standing problem in cosmology, namely the inability of state-of-the-art computer simulations to describe the distribution of dark matter in disk galaxies. It was thought that random motions could explain that inability, but our data show otherwise," de Blok explained. The THINGS images revealed what Elias Brinks of the University of Hertfordshire, UK, called a "stunning complexity of structures in the tenuous interstellar medium of the galaxies." These structures include large shells and "bubbles," presumably caused by multiple supernova explosions of massive stars. Analyzing the detail of these complex structures will help astronomers better understand the differences in star formation processes in the varied types of galaxies. Even such a simple question such as how big are the disks of gas in spiral galaxies had largely eluded astronomers previously. "The quality and sensitivity of the THINGS images has allowed us to see the actual edges of these disks in a large sample of galaxies," said Brinks. The new survey also showed a fundamental difference between the nearby galaxies -- part of the "current" Universe, and far more distant galaxies, seen as they were when the Universe was much younger. "It appears that the gas in the galaxies in the early Universe is much more 'stirred up,' possibly because galaxies were colliding more frequently then and there was more intense star formation causing material outflows and stellar winds," explained Martin Zwaan of the European Southern Observatory. The information about gas in the more distant galaxies came through non-imaging analysis. These discoveries, the scientists predict, are only the tip of the iceberg. "This survey produced a huge amount of data, and we've only analyzed a small part of it so far. Further work is sure to tell us much more about galaxies and how they evolve. We expect to be surprised," Walter said. In addition to the presentations made at the Austin AAS meeting, THINGS team members also have submitted a series of scientific papers to the Astronomical Journal. The THINGS project is a large international collaboration led by Walter and includes research teams led by Brinks, de Blok, Michele Thornley of the Bucknell University in the U.S. and Rob Kennicutt of the Cambridge University in the UK.